It was a joy to learn with the bright students at Baltimore Polytechnic Institute last week. The students worked hard and offered the guest speakers great questions and great respect. I’d like to challenge the students (and anyone who wishes) to understand and present the City Schools energy data accurately and informatively. Access to open and accurate information can help us understand and solve problems. I’ve put together graphs and pie charts using the water data supplied by City Schools. More data from City Schools is available in the resources section of this website. Please use the original data from City Schools to create your own graphs or check the accuracy of my graphs. Here are some important items to consider when we interpret this data and create our graphs and charts. 1) Schools vary by size, so we would expect to see some differences in energy and water use between schools because of their size. You may want to create graphs that show the square footage of the building next to their water or energy use. as we interpret the numbers. or staying open longer for school events could increase energy use. These things support students and the community, so we don’t see this as waste. 5) Does the presentation of our information (graph, chart, written or spoken language) clearly and accurately explain the situation? 6) Did we include all relevant data and captions explaining how to interpret and act on the information we supply? 7) Is a high utility bill a temporary problem that is solved immediately, or is it a long term problem that hasn’t been addressed? Water use at Baltimore City Public High Schools. 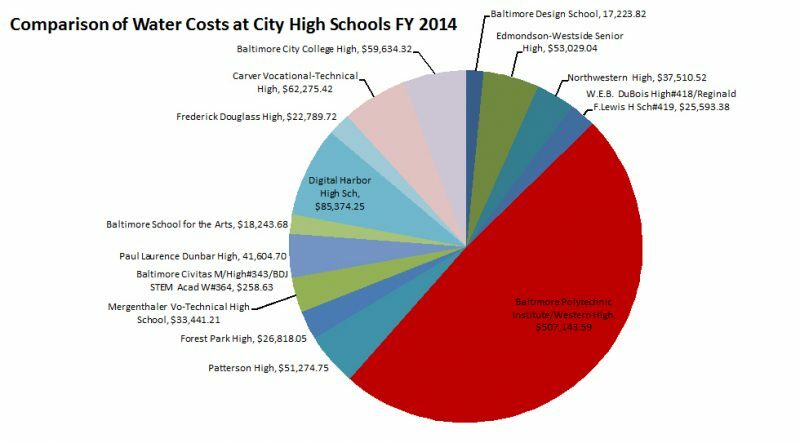 I’m looking forward to seeing your charts and graphs on the energy and water use of the Baltimore City Public Schools.